LINCOLN CITY – The Lincoln City Cultural Center’s first full season of Celtic music and dance will continue on Saturday, Jan. 12, with a visit from The Stomptowners. This Portland-based quartet blends dynamic traditional Irish music with voice and hot Irish dance, “putting the stomp back in trad” with energy and talent that will liven up your mid-winter weekend. Advance tickets to this Celtic series concert, sponsored by Salishan Resort, can be purchased via the Center’s website, and by calling 541-994-9994. Showtime is 7 pm. The Stomptowners offer a rare experience, blending Uilleann Pipes, Irish bouzouki, fiddle, whistles, breathtaking vocals and driven foot percussion. The tradition comes to life with the energy today’s audience craves. It is often said, about The Stomptowners, that they offer something for everyone. A typical performance includes smoking hot Irish and Scottish tunes, choreographed Irish dance, voice with foot percussion, arranged songs as well as evocative a cappella pieces. The Stomptowners repertoire is always kept fresh, alive and relevant to the season. The Stomptowners are vocalist Andrea Wild; Uilleann Pipe player Preston Howard; Irish Bouzouki player Richie Rosencrans; and dancer Kelsey Wilson. Born in Liverpool, England, Andrea Wild grew up with the sibling singing tradition emphasizing harmony and a capella performance. Her mother was from Caernarfon, Wales, so Andrea grew up in a Welsh speaking household hearing traditional, Welsh songs during childhood. Andrea and her brother Straford began singing in folk clubs throughout the North of England and Andrea was a regular at Liverpool’s Irish Centre. Their love of traditional folk music and a quest for adventure brought them to the United States, where they collaborated with Oregon Symphony cellist Jim Smith and performed at festivals throughout the U.S. as Both Wild. They released a CD recording in 2002 entitled “Just Say Nevoth.” In 2011, Andrea teamed up with Sean Nos dancer, Maldon Meehan with a goal to merge traditional forms of percussive dance with song for stage performance. And thus was the birth of The Stomptowners, a project that continues to grow and please crowds from Portland to beyond. Preston Howard grew up in Northern California, where he first heard Irish traditional music in the form of a Finbar Furey recording belonging to his father. This recording sparked Preston’s deep interest in the Uilleann pipes. After several years playing whistle, flute, and Scottish bagpipes as a child, Preston began learning the Uilleann pipes at age 17 with the help of many kind traveling pipers as well as the Pub Scouts, the local Irish music collective in Chico, Calif. Preston now resides in Portland, where he frequently plays at regional ceilis, Sean-nós Northwest workshops and events, local sessions, and performances. Richie Rosencrans (bouzouki/guitars/vocals) has been performing from an early age. A self-taught guitarist and songwriter, Richie found his way to traditional Irish music while studying Civil Engineering at the University of New Hampshire. His love of music and outdoor adventure attracted him to the Northwest four years ago and when not on the trail, you’ll find him performing weekly in Portland. His accompaniment style is highlighted by a sympathetic ear toward the tunes with open lifting chords and playful countermelodies. Kelsey Wilson hails from a small Northern California town. Her love for movement to music began with dancing to her father’s records, and in ballet lessons encouraged by her mother. Her dance journey has led her to various styles, such as ballet, modern, jazz, tap, and African. Her first Irish dance steps were learned from Maria Oliver in Chico, Calif. She went on to compete in regional, national and world Irish dance competitions, under the instruction of Kathleen Deely Braten, Kathleen Maeve-Smith, and Patricia Kennelly. Whilst completing her bachelor’s degree in Theatre Arts at CSU Chico, she first learned sean-nós dance from Maldon Meehan at Lark Camp in Mendocino, Calif. Spellbound and inspired by the dance’s integral relationship with music, culture and community, she has since studied with Nic Gareiss, Siobhán Butler, Alicia Guinn and Ben Power. Throughout the journey, she’s enjoyed the delight of dancing with a variety of players, such as The Pub Scouts, Dervish, Men of Worth, Kevin Carr, Molly’s Revenge, Na Rósaí, and more. 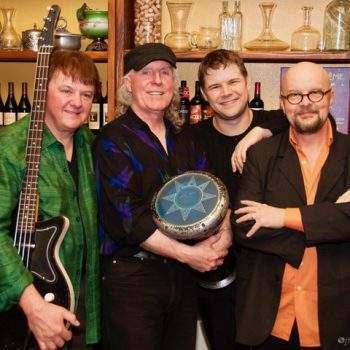 The Stomptowners’ Lincoln City appearance is part of the Cultural Center’s 2018/19 Celtic Music Series. Advance tickets for the Jan. 12 performance are $25 adults/$23 seniors/$10 youth ages 18 and under; LCCC membership discount applies. The series will continue with a holiday concert with The Outside Track (Feb. 3) and Realta (March 9), and concluding with the incomparable Tannahill Weavers (April 7). For details head to lincolncityculturalcenter.org or call 541-994-9994.